Billboards2Go.com is continually moving forward with innovation and quality. 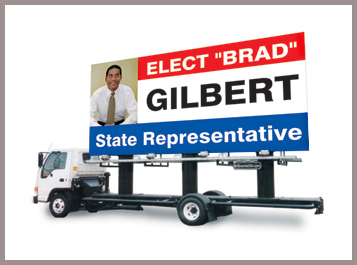 Follow us by logging on to our web site, or our blog for our latest mobile billboard news. We will try to update the information as timely as possible. Here on the News page you can find out what’s going on with our company – and if we are offering any special discounts for the month. ● Eco-Friendly Commitment – Carbon Neutral Strategy. ● GPS Satellite Tracking – 100% Proof-of-Performance. ● Political Campaign Packages – Your secret weapon to a winning campaign. ● Supermarket Grand Openings – Market saturation within two to four weeks. ● Automotive Brands – Reach your target audience in bumper-to-bumper traffic. ● Parade Floats – For a quick and easy Parade Float our billboards look great. ● Radio Broadcasting – Add FM Radio to your ad to really drive home your message. ● Charitable Discounts – Charitable Organization and Public Service Announcements & Others. ● Custom Extensions – We can fabricate custom design elements for your billboard. ● Monthly Specials – Click to see what special offers we have for you this month. ● Our Hobby – Drag Racing. Billboards2Go.com has its own NHRA competition dragster. *One Free Banner Set with a minimum of a one week mobile billboard campaign. Local hub markets. Free ad design assistance. Holidays not included. No other restrictions. Interactive Billboard Ads: A radio broadcasting feature will add to the overall media delivery experience. For a nominal up-charge your professional sounding looped message may be heard on a car’s FM radio station that’s near your mobile billboard truck. Our high-tech broadcasting equipment is FCC compliant. It is like having your own personal network radio station working hard for you. There’s no better feeling than helping out a good cause. That’s why we offer a Charitable Org Discount. If your message is educational, religious, or other activities serving the public interest or common good, you may be eligible for a substantial discount. *Ask your Billboards2Go.com rep about other discounts you may be eligible for. Our mobile billboards make awesome parade floats… for a lot less cost than the more traditional pickup-truck pulled trailer floats. Plus, its quick and easy to have your float ready for your event. 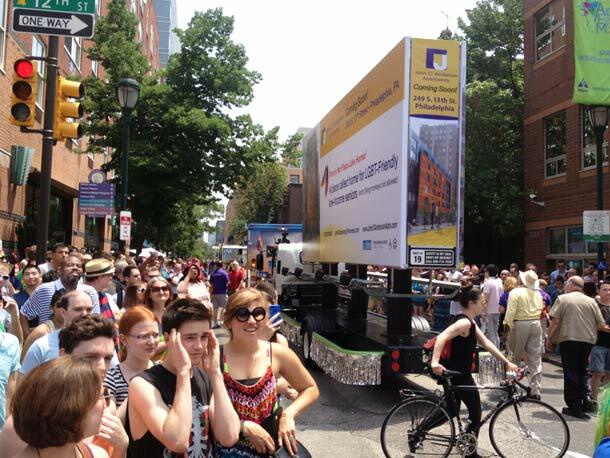 Within a matter of a few days you can have about 500 square feet of message space rolling down the parade route! 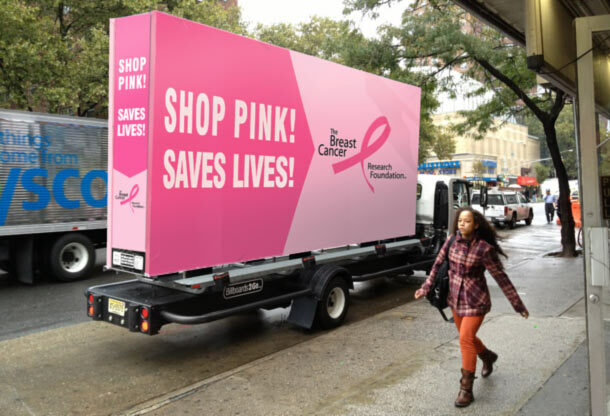 With our “pedestrian safe” nerf bar design our billboard trucks are the perfect answer to your parade float needs. Need a custom fabricated billboard design? 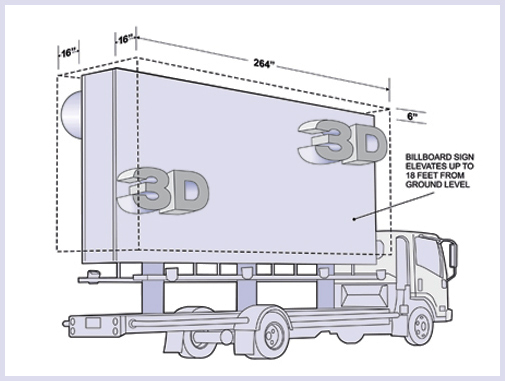 Our mobile billboards were designed to carry extra weight to offer the ability to have custom 2D or 3D elements attached. Your project deserves the most creative implementation possible and we’re ready to fabricate a billboard truck that will turn heads. Let your imagination soar! Reach drivers where they are a captive audience…. behind the wheel of their cars in heavy traffic. Since many of the “car buying” demographic may be found driving in the local area near your dealership, the best way to reach them is with a huge in-your-face triple-sided moving billboard. From driving in bumper-to-bumper rush-hour traffic to parking near major intersections and other prime venues, our mobile billboards will help bring in the customers to your showroom! We put the GRAND in Grand Opening! And, we can put your store “on the map!” With a 2 to 4 week mobile billboard campaign your location will break all-time sales records! We know, because we’ve done it may times before. 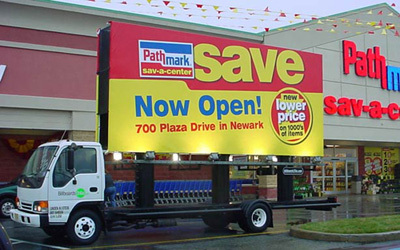 From ribbon-cutting events to local market saturation, a single mobile billboard will be a valuable marketing asset. YES, WE TALK POLITICS… How about maximum exposure for your next political race? You’ll stand way out from your opponents with our elevating sign technology. You can target your specific demo, neighborhood or special event with the biggest billboards available! Our easy, turn-key exposure programs bring home the votes! 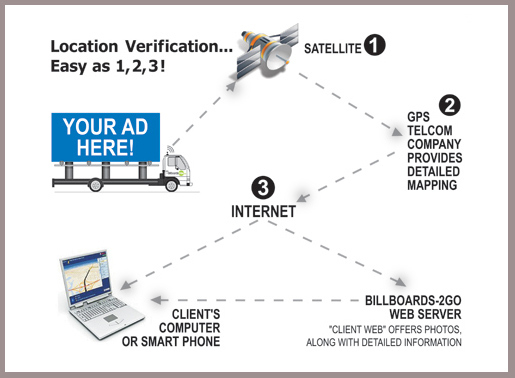 We give our clients the power to check the location of their mobile billboard advertisement anytime 24/7 on a PC, Tablet or Smart Phone. Along with GPS tracking we offer photo proof available on a private website to ensure that you are getting exactly what you paid for… and more! Our fleet of mobile billboards use advance emissions technology sanctioned by California’s strict commercial truck emissions standards… the most stringent in the USA. Besides the ability to recycle our banners in an eco-friendly manner we offer them to be re-purposed and for humanitarian use as shelter covers.